Allow quick and easy portable access control. 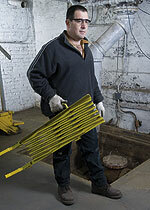 They're galvanized steel and powder coated in safety colors for high visibility. Introducing our Newest Product! 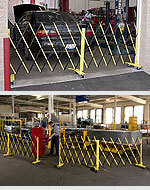 Free Standing Barrier Gates  Seal Off Hazards and Protect Against Accidents. Barrier Gates are Perfect for Temporary Access Control. You can seal off access to any area temporarily  for maintenance, cleaning and repair work  and still allow multiple entry points. They're ideal for warehouses or factories, and for restricting aisle access in retail environments. They're Riveted Back to Back with Aircraft Quality Aluminum Rivets  they hold up to more stress and they will not rust  ever! And they won't crack and the webbing won't separate.
. They'll even fit in the back of a truck or maintenance cart so you can take them exactly where you need them! Easy-to-follow installation instructions for our Barrier Gates (pdf). Complete specifications for our Barrier Gates. Complete listing of all available hardware and accessories for all Steel Folding Security Gates. A galvanized steel finish is standard, but custom powder coating is also available for all Steel Folding Gates. Matching existing color schemes in your facility is a breeze. 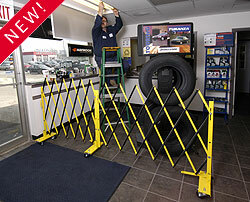 Click here to find a dealer in your area, get more information on Barrier Gates and pricing. Barrier Gates can be combined to form a continuous boundary to seal off areas of any size or length.